Liberal, Kans.—The Pancake Day Baby Cakes Award this year goes to Julian Keith Meza born 1:24 p. m. Feb. 28, 2017 weighing 7 lbs. 3 oz. and 20 ¾ inches long. Julian’s parents are Juan and Teresa Meza of Liberal. 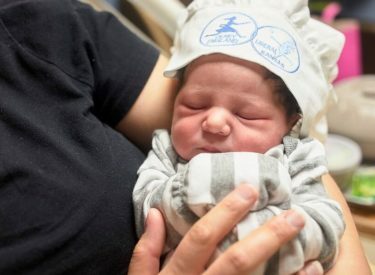 The Baby Cakes award is presented each year to the first baby to arrive on Pancake Day, or the closest day after, at Southwest Medical Center. Julian received a miniature chef’s hat embroidered with the Pancake Day logo, a plaque, and a basket of baby necessities. The Baby Cakes Award was donated by Russell Child Development Center. Russell Child Development Center offers FREE services to children and their families across 19 Southwest Kansas counties.